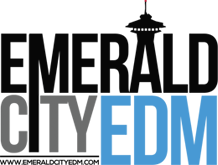 EmeraldCityEDM | Shpongle: Museum of Consciousness Tour & Ticket Giveaway! 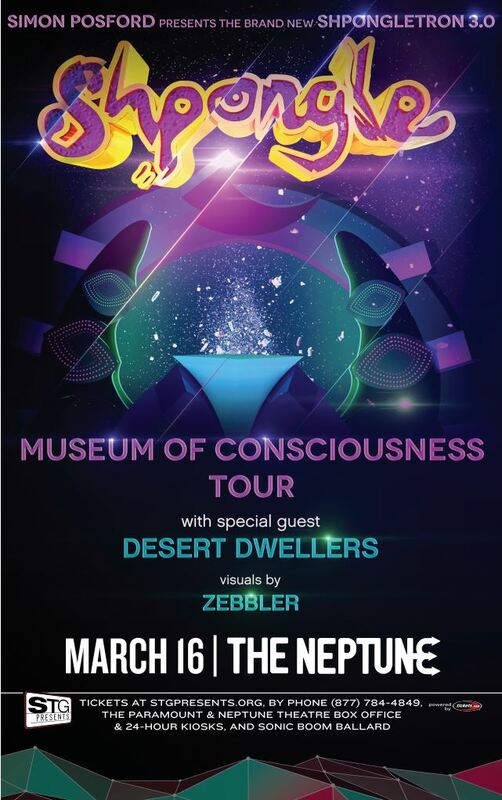 Shpongle: Museum of Consciousness Tour & Ticket Giveaway! *Purchase tickets in person at the Neptune or Paramount box offices or at the Paramount’s 24hr ticket kiosk to avoid paying service fees. Winter of 2014 will see Simon Posford present his brand new psychedelic structure titled, “Shpongletron V.3” to the United States on his Museum of Consciousness tour to support the latest album release of the same name. Kicking off Feb 12th through April 5th, he will be joined by the Dessert Dwellers as well as visual artist Zebbler, as they travel to all corners of the United States, including California, Florida, Texas, Wisconsin and New York to name a few.With over 80 years’ experience collectively Simon Posford and Raja Ram are more than qualified for the exploration into the unclassifiable music frontiers they have ventured into; ‘SHPONGLE’ is a new world of traditional sounds, acoustic guitars, Moroccan drums, Turkish operatic singing, cello, double bass, backing vocals and silver flute blended together with the computer wizardry of Simon Posford’s studio production. About Shpongle: Shpongle is a psychedelic downtempo or “Psybient” music project. The members are Simon Posford (aka Hallucinogen) and Raja Ram (one third of The Infinity Project). Simon takes care of the production, instrumentation and programming, while Raja Ram is the flautist and Cunning Linguist. They DJ separately and together, Simon having just completed 52 shows in the USA touring with a visual extravaganza known as ‘The Shpongletron’. Dongle and Mongle are the only two other words rhyming with Shpongle…a strange hybrid of electronic manipulation and shamanic midgets with frozen digits squeezing the envelope and crawling through the doors of perception, find a new pair of dice…extra numbers and colours an infinite expanding bubble, filled with a bizzare, strange world of dripping hallucinatory wallpaper, a garden of earthly delights………..­Shpongleland…..a place of well being, and reflective surfaces, morphing like an anacondas skin and shimmering like a million colour changing squid, at fifty fathoms.. truly unfathomable like seperating water from it’s wetness, the Ineffable Mysteries unweave …..
Stay up to date on more upcoming public electronic dance music events in the Seattle area by following the EmeraldCityEDM Event Calendar.